make a version for linux? We would only make a Linux version if we were confident we would recoup the $500,000 it would cost us to build it. Would it work through WINE or something similar, would that be any cheaper? Affinity is about, amongst other things, the "experience" of designing things.. 60fps, fluid navigation and editing of documents is at the heart of what we do. WINE is a wonderful project, but I don't think it would work for Affinity - performance is close to native, but support for things like our use of OpenGL / input interaction would take some work. It also assumes a Windows build to map onto WINE libs - which we don't have. You have more chance of convincing us to make a native Linux version than a WINE one.. I won't rule out making a Linux version of Affinity, but I need someone to show me a combination of distro, desktop topology and deployment (paid) platform where we would recoup our development costs. If someone can show me that, I'll be willing to talk some more about it all..
Hi AndyS, I just remembered that I had Zero success with DP on PlayonMac and WINE. So maybe a dedicated Linux version would be the only way to go. As for versions of Linux paid/unpaid the website www.distrowatch.com would be the best starting off place; as this is where most Linux users end up. This is a very slick and informed Linux OS style appstore. Also might I recommend www.sourceforge.net. You should also get AD and its siblings on www.alternativeto.net, as word gets around then being on this comparison website is a must. The distro Pear Linux OS 5 was/is a beautiful clone of Mac OSX, then some very secretive big fish paid off David Tavarres to stop completely after version 8. Serif on Pear...yeah that would have been fantastic. Yes, the linux community is divided into free/open/commercial flavours with varying levels of support. So with programs like Inkscape and GIMP: free and nowhere as slick as AD - so it has got to be worth a try. So maybe contacting LinuxUser or similar sites and forums might work. Use the MS Surface or Samsung Galaxy tab as a benchmark perhaps? Sorry that I can't give you any more than this, I don't know any more, hope it helps. Good luck with Linux and maybe one day Android. Ps would crowd sourcing work? As an X-Plane user and a Mac developer I have to take my hat off to “Austin Meyer”, the author of X-Plane for one major aspect. I do not know exactly what development environment he uses but the program is absolutely massive. My upgrade last night included over 41,000 files. To top that off X-Plane runs exactly the same on OS X, Windows and Linux. I have no idea how he does it but I think he must have developed his own, entirely proprietary GUI that does not depend on any specific platform. All I know is it is one phenomenal piece of software and it works as advertised across three different platforms. The man is a genius in every sense. Sort of like the Affinity Team. OS X 10.9.5, 24" iMac, 3.06 GHz, 4 GB 800 MHz DDR2 SDRAM, NVIDIA GeForce 8800 GS 512 MB, 1 Terabyte hard drive. Mac User since 1985. Author of “SignPost” for vinyl sign cutting. Win and OSX are going freeware. Ironically Linux distros may go for pay models. Why do i think that will happen? Well i can't explain because my English is bad but it has to do with something called personal data mining. On behalf of this software. I would never back software company that want ridiculous $500.000 for frontend, it's wasted effort. Propriatery software is not ethical. If you run propriatery software on GNU/Linux then you are in atleast same security danger as Mac user. For end i want to remind everyone asking for linux port that CRM staff wrote this incredulous price of $500.000 with other ignorrant jokes. I know this thread is old, but I got linked to it from my recent post regarding Affinity for Linux. I've been active in the open source community for years, but the lack of professional graphic software "forced" me to stick to Macs. I've had many discussions on how ethical or unethical closed source is, but let me give you insight from the end user's perspective: Frankly, no one gives a damn whether or not the software is GPL, as long as it gets the job done and is worth its price and distributing model. If there was a software solution that is open source and at least as good as its competitors, I'd be more than happy to use it, but not because it's free, but because it's good. Quality should be always before politics and ideology. That's what made some other open source projects very successful (Open Office, Firefox etc). Perhaps there could be ways to raise some funds to get this thing going. I can try to check different communities and see if people would be interested in this. Many use Linux already so maybe the user base might be bigger than we think. pxlgrl, you should read the story about LibreOffice and its relationship to OpenOffice. Perhaps that gives some enlightenment when it comes to open source software that involves a lot of work and a lot of money to develop. "Proprietary software is not ethical." Really!?!?!?! How??? Because someone earns a living from it. Because they don't do all the work and then give it away to you for free? Exactly. There must be some money involved in a project if it's to meet certain quality standards. There's nothing wrong to pay for good software regardless if it's proprietary or not. Even open source doesn't mean it has to be for free. What it boils down to is quality (UI/UX) and excellent costumer service. Affinity definitely does a good job on both ends, even though it will take a little till it's going to be a replacement for the usual suspects. Favourite Linux distro: Pear OS: free. Favourite OS: Mac OS X: free ugrades. Favourite hard drive recovery software: DiskDigger...legendary! If Stan Lee did HD recovery software! Free!!!! Favourite Win software: Serif Plus ware. Paid for. Favourite Mac art Software: Affinity of course! Paid for. Favourite Mac music Software: Arturia ARP 2600 Emulator! Paid for/Free 20 min demo. Favourite Mac console emulator: OpenEmu! Free. So let's put the ethics question to bed, once and for all. These people, have built these apps through blood, sweat and tears. They deserve thanks and respect and if they have the cheek to ask for payment: for the privilege of making your like easier/happier. Remember this...Do you want them to claim welfare/benefits/dole or do you want them to get a job, and stopping spongeing off the state. They also have gas/electric/food/mortgage/taxes to pay for. We all deserve good apps/software. We must show gratitude too, whether it's via WOM, online recommendations, like on FB/Twitter/Pinterest, 5* reviews or just a token donation. Either way, we should all be grateful for this and dump the politics. Has anyone from Serif spoken to Canonical, the company behind Ubuntu? They include commercial software in their Software Centre, unlike most GNU/Linux distros which adhere to FOSS. Ubuntu, yes! Great idea Paul; Mark Shuttleworth? Is he still in charge? The 'Jaapie' is very much in charge! Let the cats see the penguin and get Affinity and Canonical together. I've used and enjoyed Ubuntu Meerkat prior to Pear OS 5 for several months, when WIn XP/7 was giving me headaches too :angry: :wacko:). This is a good base as the Russians now have Ubuntu mobiles. Seriously we Need a Affinity like softwares for Linux. So Developers want 500000. I believe, If every Linux User Donates $1, the donation will exceede your target. You just need to set a page for collecting donations and put the word out. Every Linux (Graphics)user will support Affinity. Please give it just 1 try at-least and put the word out. All our Linux community will support. We love and support Good, Quality softwares. 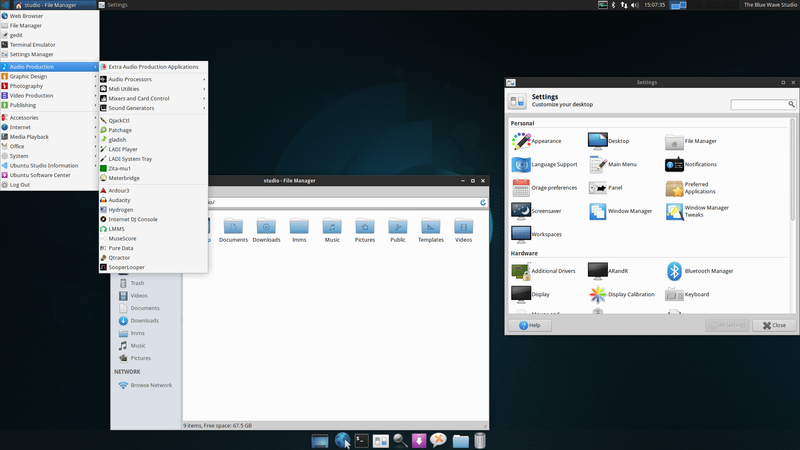 Ubuntu/Mint/SUSE/Fedora are few good flavours for Linux platform. Hope to see a donation page soon. Quote:In the last 25 years Lightworks has been used to edit some of the finest films in cinema history: The Wolf of Wall Street, LA Confidential, Pulp Fiction, Heat, Road to Perdition, Hugo, The King’s Speech and many more! So if the product is right (Affinity is) and the price is right (natch! ), then it should be time to put out the feelers. So why not tweet/FB a straw poll to see what the demand is, rather than speculate? Have we enough people in this forum, to set that ball rolling? It seems to me that there is a separate, and possibly larger issue here. The fact that this is apparently a small company, with a dedicated but limited staff, working very hard to get two high quality products to market. They have had to push the Affinity Publisher beta release. It seems very counter productive to do a survey on the present demand for a product you may not even be able to start planning for maybe 2 years. Not to mention committing now, to a Linux version, and then having to listen to people complain about how long it is taking to release it. Nothing kills a company faster than taking on more they they can handle. It's easy from the outside to say "What about this feature? Why haven't you added the ability to do such and such? It's been a year a still nothing! This shouldn't be that hard!". We don't know the difficulties the developers face. The issues they are trying to resolve and those unforeseen they will have to handle. Nothing is impossible for those who don't have to do it. Not long ago neither of these apps existed and they are being expected to live up to programs that have been enhanced and redefined for 20 years. And now they should also take on Windows and Linux versions because clearly they don't have a well thought out business plan and are just making decisions on the fly. Come on. Cut them some slack. I agree whole-heartedly. This and taking on enough to where you can finish but not do anything well. All valid points! As far as I understand it, this forum is for members to get acquainted with the software, learn how to use it, get tips and tricks, find help from more experienced users and/or moderators, get links to tutorials, read news when a new version is out and where to download it. Also, report bugs we find to help make the apps even better than they already are or ask for missing features that would make our lives easier using the apps. It is NOT for whining about the software not being released for other OSes. Sure, I’ve complained to companies about their software not having a Mac version in the day but I’ve always done it discreetly, via email or contact forms, hoping that companies would see it would be a good thing. If it didn’t happen, I learned to live without it. Public whining only bores, antagonizes or annoys some members that are here for the real and valid reasons of joining this community. 2- the official replies were already given. To those people who come here just to demand this or that version, take some of your time and look for a similar software that is already available for your platforms (yes, there are apps out there for you!) and use that instead. And leave the devs alone so they can do their real job! Please! Thank you! i will instantly buy both products for linux the day they are here, honestly.